Aims: This study aims to evaluate the knowledge and attitudes of the dental graduates regarding the clinical application of the theories of child psychology during the behavior guidance while treating children in the routine dental practice. Materials and Methods: A structured close-ended questionnaire comprising of 14 questions related to the theories of child psychology and behavior guidance was prepared. The validity was tested by mailing the questionnaire to 10 experienced pediatric dentists and modified based on their suggestions. The modified questionnaire was distributed to 300 (postgraduates [PGs]; students on compulsory regular rotatory internship/interns; undergraduates [UGs]) dental students belonging to a private institution. The data were obtained, tabulated, and analyzed statistically. Results: Many of the respondents had knowledge regarding basic behavior guidance techniques (BGTs) such as tell-show-do, positive reinforcement, distraction, and modeling. Knowledge and practice on advanced BGTs was minimal. Conclusion: PGs had better knowledge, compared to the UG students. Hence, there is a need to build awareness among the UGs, relates to child psychology and its application during treatment. Behavior guidance/management of the child is an integral component in pediatric dental practice. A considerable percentage of children do not cooperate in the dental chair, limiting the provision of quality dental care. Dentist must rely on behavior guidance or management techniques as alternatives or adjuncts to communication in treating the uncooperative child. These techniques include tell-show-do (TSD), protective stabilization or physical restraints (both active and passive), hand-over-mouth exercise (HOME), though not recommended contemporarily, conscious sedation, and general anesthesia. Behavior guidance techniques (BGTs) are employed to establish communication, alleviate fear and anxiety, facilitate delivery of quality dental care, build a trusting relationship between dentist, child, and parent, and promote the child's positive attitude toward oral/dental health and to cope with dental treatment procedures undertaken. The child's behavior on each dental visit depends on the variables such as age, parental behavior, parental anxiety, past medical/dental history, the awareness of their dental problem, type of dental procedure, the behavior guidance/management, and the procedural techniques followed by the dentist. Application of BGTs requires skills in communication, empathy, coaching, tolerance, flexibility, and active listening. As such, behavior guidance is a clinical art and skill built on the foundation of science. It is vital that the dentists should be aware of the wide range of BGTs to meet the needs of an individual child, tolerant and flexible in the implementation of these techniques. Failure to manage a disruptive child can place the child, dentist, and other staff at risk, which may compromise the quality and efficiency of the dental care. It is necessary to predict children's dental behavior and identify the children at the risk of behavior problems before such situation arises. It is essential to develop an appropriate management strategy during the first dental visit. Kuhn and Allen  opined that the utilization pattern of BGTs has changed over the past three decades. Parental acceptability, legal/ethical concerns, accessibility, and feasibility of certain techniques are the factors most often cited for these changes. Dental students receive theoretical and clinical training on BGTs at the graduate level. Therefore, the content of the educational curriculum and the degree of training in BGTs may have an impact on students' perceptions and practice of such techniques. Therefore, the present study was aimed to assess the knowledge of dental graduate students regarding the theories on child psychology and the application of BGTs in the management of children during dental treatment. 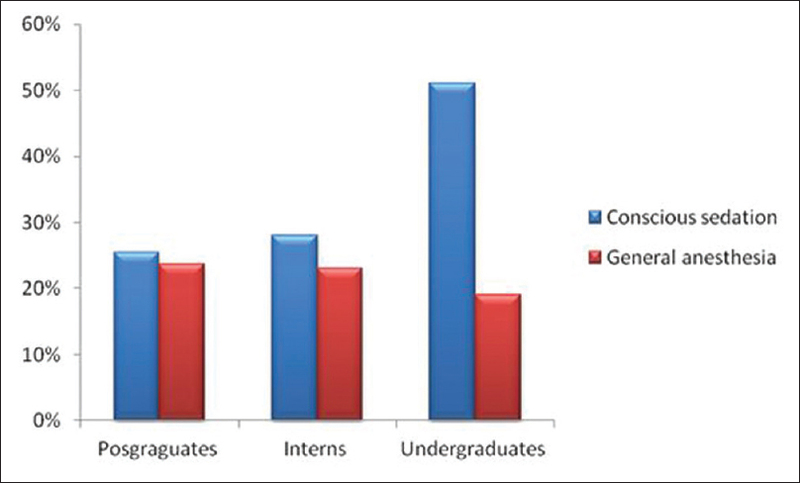 A cross-sectional study was conducted among dental students from Narayana medical institutions. Structured close-ended questionnaire comprising 14 questions related to the theories of child psychology and their application in behavior guidance was prepared. It included questions concerning awareness on different BGTs, self-reported skills, and their application during managing a child in dental clinics. The behavior guidance/management techniques were grouped consequently into various techniques, namely (1) reinforcement techniques, (2) aversive techniques, (3) desensitization techniques, (4) communicative techniques, and (5) pharmacological techniques along with techniques based on psychology theories, i.e., (1) cognitive behavioral techniques, (2) psychosocial and psychoanalytical behavioral techniques, (3) behavioral techniques based on operant conditioning theory, (4) behavioral techniques based on classical conditioning theory, and (5) behavioral techniques based on social learning theory. The questionnaire was distributed to three groups, Group 1: postgraduates (PGs), Group 2: students on compulsory regular rotatory internship (CRRIs) or interns, and Group 3: undergraduates (UGs) belonging to the private institution, who were involved in the study. Stratified cluster sampling design was employed using the private institution as a sampling unit. The questionnaire was distributed to all the participants in the three groups. The obtained data were tabulated, processed, and analyzed using a SPSS version 20.0 (Statistical Package for Social Sciences, Chicago, IL, USA). Statistical analysis was performed individually to the three groups (intra-group) and among the three groups (inter-group) with Chi-square test. Among the 300 students, only 255 (PGs (55), CRRIs (100), and UGs (100)) had responded to the questionnaire in this cross-sectional study, of which 43.5% (n = 111) responded that they apply child psychology theories in their daily practice which was statistically significant (P< 0.05). Most of them were PGs (49.1%), compared to CRRIs (42%) and UGs (42%). When assessing the knowledge about concept of centration, only 46.7% responded correctly, which was statistically significant (P< 0.05). Regarding the type of guidance technique to manage these children, 51.8% of respondents had no knowledge about guiding a child with centration. For building rapport with children of age 4–7 years, 43.1% opted for both explaining about new things observed in the dental operatory and allowing the child to handle and test how the instruments work. For the children who show defiant behavior, 54.1% followed promising a toy (positive reinforcement), 25.9% responded that aversive conditioning is effective, while 20% used sending the parent outside the operatory for managing these children. Concerning the knowledge related to symbolic pretend play during treatment in children of 2–7 years, 61.2% have responded correctly. Regarding management of children with previous bad dental experiences, 41.6% opted for using systematic desensitization. Conscious sedation was opted by 36.5% respondents, whereas general anesthesia by 21.6% respondents [Figure 1]. Among the study populations 51% UGs preferred conscious sedation and while PGs given almost equal priority to conscious sedation (25%) and general anesthesia (24%). For a question on parental presence while treating children of 0–2 years, only 40.2% have responded correctly. Related to the usage of euphemisms among 2–7 years age children, 54.5% responded appropriately, which was statistically significant. To build rapport with children of age 7–12 years, 53.3% responded that engaging children in their area of interest may be helpful, while 27.1% felt that systematic desensitization could be helpful. About the aversive techniques, 36.5% responded with using HOME, 35.7% with voice control, 21.6% with immobilization by parents/staff, and 6.3% responded that they use immobilization with physical restraints in managing uncooperative children. Regarding the distraction technique, 58.4% opted for conversation with the child during treatment, 25.5% for using audiovisual aids, while 16.1% for asking the child to bring his/her favorite toy during the appointment. For modeling technique, 36.1% opted for siblings and 34.5% for the same age and gender, whereas 29.4% for parents as effective live models. Detailed description of values on various guidance techniques and their knowledge in relation to theories among PGs, CRRIs, and UGs is presented in [Table 1]. Child psychology is the science that deals with the study of child's mind and its function. Guidance of child's behavior in the dental office is an essential prerequisite to accomplish appropriate dental care. To treat a child successfully or manage the children in a dental setting, one should have sufficient knowledge on the psychological development of a child, related dental anxiety, fear, and various modalities of behavior guidance. Hence, there is a need to evaluate the knowledge and attitudes of dental graduates regarding the theories of child psychology and behavior guidance. The knowledge and perceptions on BGTs were previously reported by Sotto et al. among 1st-year dental students after an educational course conducted on BGTs. In the present study, positive reinforcement, distraction, and live modeling were reported to be most commonly followed. The children of age group 0–2 years are emotionally attached to their parents and depict separation anxiety. Therefore, parental presence in the dental operatory is a crucial factor among these children during their management. Practitioners should get accustomed to this added involvement of parents and welcome the queries and concerns.,, Nonetheless, 40.4% of students in the present study reported that they allow parental presence in the operatory while treating the child. As the child reaches 2–7 years, they represent objects symbolically and attain imaginary means of thinking. They correlate things with other objects which they are accustomed to. Thus, “euphemisms” can be used to explain about the procedures and equipment in this age group of children. Much of the child's energies are tested to develop new skills and acquire new knowledge. They are intensely curious about the dentist's office and eager to learn about the novel things around. Hence, explaining about the treatment procedure and allowing them to handle and test the instruments' work would be a motivating factor in managing these children. The knowledge on using symbolic pretend play and building rapport with this age group of children was high in the PGs and CRRIs, compared to the UGs. Regarding the usage of euphemisms, PG students had better knowledge. This difference in the knowledge would be due to better awareness among PGs and CRRIs regarding child's developmental age and cognitive levels as well as their level of exposure in treating these children. Dental anxiety is high among the young children, but it also manifests in the older children, influencing the child's behavior in the operatory. For the management of these children, many BGTs such as desensitization, modeling, positive reinforcement, and distraction are available. Desensitization technique can be followed in a child who has preestablished fears and anxiety, and the child is gradually introduced to noninvasive to minimally invasive procedures through the invasive treatments until there is no evidence of stress on his part. It was also reported by Davey  in his Latent inhibition theory that children tend to become less anxious if they have had more neutral visits before exposure to invasive dental treatments. In the present study, usage of the desensitization procedure is high among the PGs, compared to the CRRIs and UGs. Modeling is based on the social learning theory, which emphasizes the importance of observing and imitating the behaviors, attitudes, and emotional reactions of others. Bandura et al., established that modeling or learning by observation worked not only in acquisition of new behaviors but also in reducing undesirable behavior. One of the primary principles of this technique is vicarious extinction, wherein “fearful and avoidant behavior can be extinguished vicariously through observation without any adverse consequences accruing to the performer.” Hence, this technique allows for “learning without performance,” and thus, the child learns to eliminate fearful behavior without incurring the aversive consequences of such behavior. Johnson and Machen reported that same age and gender is effective within live modeling. Nonetheless, our study revealed that most of the participants have responded for siblings as an effective model. A technique found to be effective in preventing development of dental anxiety in a child, who has a potential to do so, is the use of positive reinforcement. This technique is highly effective in the children of 6–12 years, as the child drives for a sense of industry and accomplishment during this stage of development. The present study too showed that positive reinforcement is effective than other techniques in managing children at the dental clinic. If the child is uncooperative even after implementing the basic universally accepted BGTs, nonuniversally accepted techniques such as voice control, HOME, and protective stabilization can be utilized after obtaining the informed consent of the parent/caregiver. In the present study, aversive techniques were less frequently followed by many of the respondents which were consistent with Carr et al., who reported that the South eastern US dentists used less aversive techniques and a marked reduction in the use of HOME. This decline in the usage may be attributed to parental acceptability and legal/ethical concerns while using these techniques. The findings from the present study are also consistent with Grewal  from India, which showed that TSD was the most common BGT used, and the aversive management techniques were rarely used in managing children in the dental office. Nevertheless, Wright et al. reported that few of the Australian dentists used HOME. Oredugba and Sanu  reported that sedation and HOME are the less frequently followed management techniques. Allen et al. demonstrated that traditional behavior management techniques, namely TSD, restraints, HOME, and sedation were better than the newer ones such as modeling and contingency management. Thus, these findings were not consistent with the present study. The knowledge was less among all the respondents on the method of general anesthesia for the management. It may be due to the need for advanced training in pediatric dentistry program required for using these techniques. In contrast to the present study, communicative techniques, protective stabilization, and pharmacologic techniques were thought to be acceptable from a survey conducted by Adair et al. 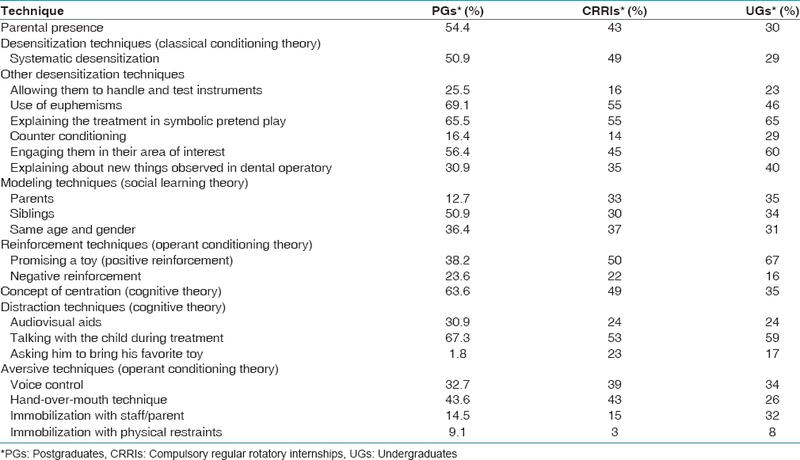 in different predoctoral pediatric dentistry programs. However, the present study was conducted among PGs, CRRIs, and UGs. Therefore, in this study, knowledge on various theories and their application during treatment procedures is not sufficient. Folayan and Idehen  suggested that there is a need of training for the students regarding basic and efficient use of BGTs during management of pediatric dental patients, which is in agreement with the findings of the present study. Only 55 PGs responding to the questionnaire in our study may be the limitation. Since the level of exposures and awareness in treating the child was better in PGs, compared to CRRIs and UGs, it would have been the reason for getting better results among PGs. The results of the present study may not be generalized to entire dental students as students from one dental institution were surveyed in this study. In general, all the respondents have rated positive reinforcement, distraction, and modeling as most commonly used behavior management techniques. Advanced behavior management techniques were viewed less acceptable. Awareness on the concept of centration, conscious sedation, and distraction other than audiovisual aids was low. Hence, there is a need for building better awareness on psychology theories and their application among dental graduates. Oliver K, Manton DJ. Contemporary behavior management techniques in clinical pediatric dentistry: Out with the old and in with the new? J Dent Child (Chic) 2015;82:22-8. McDonald RE, Avery DR, Dean JA. In: Dentistry for Child and Adolescent. 8th ed. Missouri: Mosby – An Imprint of Elsevier; 2004. p. 45-6. American Academy on Pediatric Dentistry Clinical Affairs Committee-Behavior Management Subcommittee; American Academy on Pediatric Dentistry Council on Clinical Affairs. Guideline on behavior guidance for the pediatric dental patient. Pediatr Dent J 2015;30:125-33. Feigal RJ. Guiding and managing the child dental patient: A fresh look at old pedagogy. J Dent Educ 2001;65:1369-77. Pai R, Mandroli P, Benni D, Pujar P. Prospective analysis of factors associated with dental behavior management problems, in children aged 7-11 years. J Indian Soc Pedod Prev Dent 2015;33:312-8. Kuhn BR, Allen KD. Expanding child behavior management technology in pediatric dentistry: A behavioral science perspective. Pediatr Dent 1994;16:13-7. Al-Jobair AM, Al-Mutairi MA. Saudi dental students' perceptions of pediatric behavior guidance techniques. BMC Med Educ 2015;15:120. Sotto JJ, Azari AF, Riley J 3rd, Bimstein E. First-year students' perceptions about pediatric dental behavior guidance techniques: The effect of education. J Dent Educ 2008;72:1029-41. Pinkham JR. An analysis of the phenomenon of increased parental participation during the child's dental experience. ASDC J Dent Child 1991;58:458-63. Sheller B. Challenges of managing child behavior in the 21st century dental setting. Pediatr Dent 2004;26:111-3. Davey GC. Dental phobias and anxieties: Evidence for conditioning processes in the acquisition and modulation of a learned fear. Behav Res Ther 1989;27:51-8. Bandura A, Grusec JE, Menlove FL. Vicarious extinction of avoidance behavior. J Pers Soc Psychol 1967;5:16-23. Bandura A, Menlove FL. Factors determining vicarious extinction of avoidance behavior through symbolic modeling. J Pers Soc Psychol 1968;8:99-108. Shaffer DR. Developmental Psychology: Childhood and Adolescence. 4th ed. Pacific Groove: Brooks/Cole Publishing Company; 1996. p. 255-63. Saha A, Kamatham R, Mallineni SK, Nuvvula S. A cross-sectional survey on children perception of isolation methods for restorative procedures and influence of cognitive development. SRM J Res Dent Sci 2016;7:219-21. Gazzaniga MS, Heatherton TF. Psychological Science. 2nd ed. New York: w.w. Norton and Company; 2006. p. 447-9. Christen AG. Piagetian psychology: Some principles as helpful in treating the child dental patient. ASDC J Dent Child 1977;44:448-52. Nuvvula S, Alahari S, Kamatham R, Challa RR. Effect of audiovisual distraction with 3D video glasses on dental anxiety of children experiencing administration of local analgesia: A randomised clinical trial. Eur Arch Paediatr Dent 2015;16:43-50. Delitala G. Incorporating Piaget's theories into behavior management techniques for the child dental patient. Gen Dent 2000;48:74-6. Carr KR, Wilson S, Nimer S, Thornton JB Jr. Behavior management techniques among pediatric dentists practicing in the Southeastern United States. Pediatr Dent 1999;21:347-53. Grewal N. Implementation of behaviour management techniques – How well accepted they are today. J Indian Soc Pedod Prev Dent 2003;21:70-4. Wright FA, Giebartowski JE, McMurray NE. A national survey of dentists' management of children with anxiety or behaviour problems. Aust Dent J 1991;36:378-83. Oredugba FA, Sanu OO. Behavior management techniques employed by Nigerian dentists for their child patients. Pesqui Bras Odontopediatria Clin Integr 2009;9:271-6. Allen KD, Stanley RT, McPherson K. Evaluation of behavior management technology dissemination in pediatric dentistry. Pediatr Dent 1990;12:79-82. Folayan MO, Idehen E. Factors influencing the use of behavioral management techniques during child management by dentists. J Clin Pediatr Dent 2004;28:155-61.